Back at Tommy's you made do with 4 ounces of corned beef, which strikes me as the bare minimum or possibly a kiddie portion. Now at Slyman's you fantasize about a full pound! I think you are right that Slyman's is probably at best size. I'm waiting for your reviews of Jack's and Corky's. Excellent point. 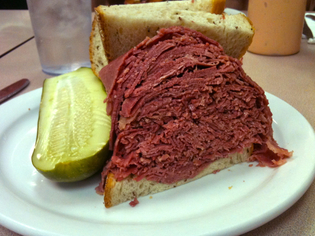 Tommy's adds quite a lot more to their sandwich than just the 4 ounces of Corned Beef which seems to make a difference in their portion size. So, while a Tommy's Corned Beef may only have 4oz, with all the other veggies and cheese they include, it's still a big sandwich. I haven't gotten out enough recently and will have to give your suggestion a solid visit.